When Karen Van Der Beken noticed that her second son, Clark, wasn’t walking at 16 months old, she worried that something was wrong. She asked her pediatrician, who told her that Clark would need therapy to learn to walk. He referred her to Easter Seals New Hampshire, which provides supportive services to children and adults with disabilities. “I smiled and left the office, but when I got home and told my husband, I broke down and started crying. When I thought of Easter Seals, I thought of braces, and crutches and wheelchairs,” she said. Regardless, she brought Clark to Easter Seals three weeks later, and he was immediately placed in its early intervention program. For three years he had physical and occupational therapy every week, and grew up strong and healthy. Her experience with Easter Seals was so positive that she joined its volunteer board of directors. Eventually she became chair of the board, during which time she co-chaired a $1.2 million capital campaign for the nonprofit, which allowed it to expand critical programs for children and seniors. In 2005, Van Der Beken — who had previously worked in the manufacturing arm of Wang Labs — joined Easter Seals New Hampshire as a staff member in its development department, and became its chief development officer in 2012. While the name may imply otherwise, Easter Seals New Hampshire operates and fundraises in New Hampshire, Maine, Rhode Island, Vermont, New York and parts of Connecticut. It is one of the most diverse and largest Easter Seals in the country. In her role, Van Der Beken oversees a staff of 14 in multiple states and has worked doggedly to expand Easter Seals in these other states where the organization is not as well established as it is in New Hampshire. Under her guidance, the wife and mother of two sons has built a strong development team that fundraises from a range of sources. The money that her team raises goes to support vital programming for thousands of vulnerable people from infancy to old age, including more than 90 programs in New Hampshire alone. When Karen came on board, contributed income in New Hampshire was $1.6 million. Last fiscal year, it had grown to $2.6 million. When she’s not busy planning an Easter Seals event or striking up partnerships with area businesses, Van Der Beken is also an avid volunteer. 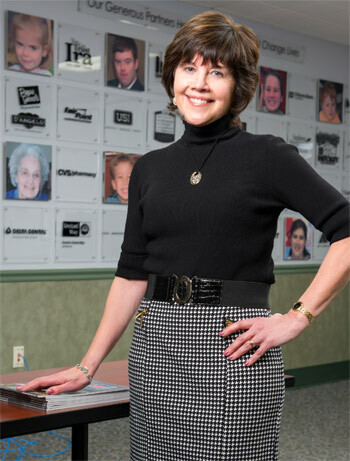 She has been chair of the endowment committee at her church since 1994, was on the board of the Mental Health Center of Greater Manchester for nearly a decade, and currently serves as board chair of Building on Hope, an all-volunteer undertaking that takes an Extreme Home Makeover-style approach to overhaul nonprofit facilities in the state. With Van Der Beken’s help, the project renovated an Easter Seals boys’ group home in its first year, and renovated the Girls Inc. facility two years later. A. One day when I was with Clark in his therapy, someone approached me and said the new president of Easter Seals New Hampshire was looking for a consumer of their services to join the board of directors. I happily agreed — I wasn’t working, so I had the time, and I wanted to give back to Easter Seals because they had done so much for Clark. I joined the board, was selected chairwoman in the mid-1990s, and after my term I was asked to co-chair a capital campaign to renovate this building. That’s where I fell in love with fundraising. I was very comfortable asking people to invest in a project where I knew so many people would benefit. Over the next few years I did some consulting in resources and board development, and in 2005 Larry Gammon asked me to head up the resource and development department in ESNH. A. I’ve really never had challenges in the workplace — in the electric utility industry, I was one of very few women, but it was never really a problem for me. I’ve been very fortunate that the people I’ve worked with in my career have been top notch and very helpful to me in every way. A. When I was involved in the capital campaign to renovate the Easter Seals facility, my co-chair, Ray Truncellito, taught me a lot about people and their inclination to give when they’re passionate about something and when they see the need for a service. He also taught me that every day brings an opportunity to do great things for others. A. Now that my children have left the nest, it’s actually very easy. I have an extremely supportive husband, David, who loves to cook which I so appreciate, and with online computing, it’s so easy to put in a few extra hours of Easter seals work after dinner or during the week. On weekends, especially in the summer, we go to Lake Winnipesaukee every weekend and that’s where I truly enjoy the downtime. A. Whether the person is a young man or young woman, I would give the same advice: Take something you are passionate about and already have an affinity for and turn it into your career. The side benefit is you get paid for it.